Media captionThe Home Secretary responds to business concerns about her immigration plans. 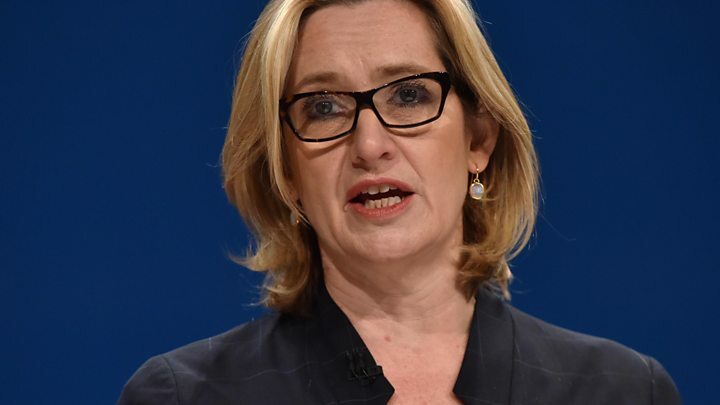 Home Secretary Amber Rudd has defended plans to make firms do more to employ British people, saying "don't call me a racist" for talking about immigration. Under her proposals, firms could be forced to disclose what percentage of their workforce is non-British as a way to encourage them to hire more locals. Ms Rudd said she wanted to "flush out" companies abusing existing rules and "nudge them into better behaviour". Business has attacked the idea while one Tory MP called it "divisive". The workforce proposal - announced at the Conservative conference on Tuesday as part of a series of measures designed to "change the tide of public opinion" on immigration after the Brexit vote - is not policy yet as it is subject to consultation. But it has already provoked a backlash, with Labour saying it will "fan the flames of xenophobia and hatred in our communities" and the SNP called it "the most disgraceful display of reactionary right-wing politics in living memory". Companies recruiting staff from outside the EU could have to demonstrate what they have done to "foster a pool of local candidates" and show what impact the choice of overseas candidates have on the local labour market. Briefing notes after her speech also suggested they could be required to "be clear about the proportion of their workforce which is international", a practice which the Home Office says is standard in the US. Ms Rudd said the existing system did not give firms a "clear incentive" to properly consider the merits of local candidates or to spend more on training to equip them to do the jobs on offer. Asked whether she was prepared to "name and shame" companies which did not comply by publishing a breakdown of the nationality of their workforce, Ms Rudd told BBC Radio 4's Today it was "not something we are definitely going to do" but it was "one of the tools" under review "as a way of nudging people into better behaviour". While many companies were doing a great job employing local staff, she said there were firms "which are not so constructive and these are the ones we want to flush out" - citing one business she knew of where 80% of whose staff were from outside the UK. "There is still one in ten 18-24 year olds in the UK who are unemployed," she added. "I want businesses to think first about locally training people where possible... and work with us to deliver what we need to have which is a more skilled local labour force." In 2009, Prime Minister Gordon Brown was criticised for suggesting that firms should give preference to local staff where they could - a policy that was dubbed in the media "British jobs for British workers". 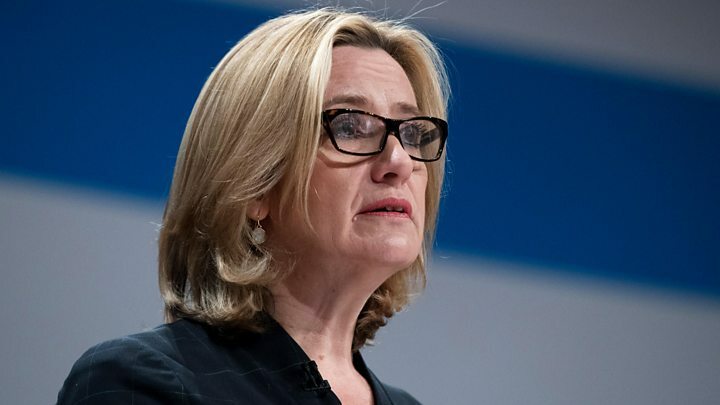 Ms Rudd, who campaigned to remain in the EU during the referendum, said she was careful not "to fall into the trap" of using such language - particularly given the volatile climate after the Brexit vote in which immigration remains a highly-charged issue and some areas have seen a rise in hate crimes. "I am very aware about the language and when I looked at the speech and thought how I would present it," she said. But she said immigration could not be a no-go area for politicians. "We should be able to have a conversation about the skills we need. "I don't think we should have a situation where we can't talk about immigration. We must not ignore the fact that people want to talk about immigration and if we do talk about immigration don't call me a racist." Business groups reacted warily to the proposals, warning they would limit their members' ability to recruit people with the right skills for the job. "Companies do so much in the UK to train up their workers and, of course, look for local hires before going to the overseas market," said Adam Marshall, acting director general of the British Chambers of Commerce. "I don't think they should be penalised for having to do so when they have specific skills needs." The EEF said more than two thirds of the UK manufacturers it represented offered apprenticeships. The CBI's deputy director general Josh Hardie said: "British companies invest £45bn a year training workers in the UK, but there are skills gaps right now and if firms do not fill them they cannot grow and spread prosperity." Conservative MP Neil Carmichael, chair of the Commons education select committee and member of the Open Britain campaign, urged Ms Rudd to reconsider the plan. "This unsettling policy would drive people, business and compassion out of British society and should not be pursued any further," he said. "People coming to the UK to work hard, pay their taxes and make a contribution to our society should be celebrated not shamed. "This kind of divisive politics has no place in 21st Century Britain." And Labour leader Jeremy Corbyn said "drawing up lists of foreign workers won't stop unscrupulous employers undercutting wages in Britain". SNP leader Nicola Sturgeon: "It is an appalling, regressive, and hugely troubling development which will leave many people in Scotland - and across the rest of the UK and beyond - wondering, with real concern, what kind of country the Tories want us to be." Lib Dem leader Tim Farron said: "The government's plan on foreign workers is a nasty little policy that deserves to be thrown out on the rubbish heap." Ministers say they are still committed to reducing net migration to "sustainable" levels - taken to mean below 100,000 a year - even though David Cameron failed to meet the target between 2010 and 2015, with net migration recently exceeding 300,000.